Industry leaders, government officials, and environmentalists gathered today in Las Vegas at the National Clean Energy Summit to discuss policy and business developments affecting the renewable energy industry. 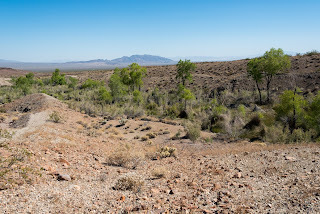 The Sierra Club's national office used the occasion of the Clean Energy Summit to celebrate K Road's Moapa solar project, which will destroy three square miles of intact desert habitat located over thirty miles from the energy guzzling Las Vegas strip. In a Facebook posting earlier this evening, the Sierra Club thanked its followers for supporting the "large solar farm" outside the city, featuring a photo of Sierra Club members rallying in front of the desert lands that are destined for the bulldozer. The Sierra Club could have celebrated plans to close the dirty Reid Gardner coal plant, and the announcement of one of the largest rooftop solar projects in the world planned for a Las Vegas resort. Mandalay Bay announced plans to build one of the largest rooftop solar installations in the world atop its casino and convention spaces, taking advantage of empty spaces in our cities to generate clean, sustainable energy. It is sad when a government official is quicker to promote sustainable clean energy than a national environmental organization. In an interview with the Las Vegas Sun, Federal Energy Regulatory Commission chairman Jon Wellinghoff called for an energy paradigm that focuses more on energy efficiency upgrades and the deployment of rooftop solar, giving consumers more choice. Wellinghoff described the Nevada utility NV Energy in euphemistic terms as inefficient and unfriendly. Nevada is sadly behind the curve when it comes to policies that support rooftop solar, and the FERC chairman was bold to call out the deficiency. 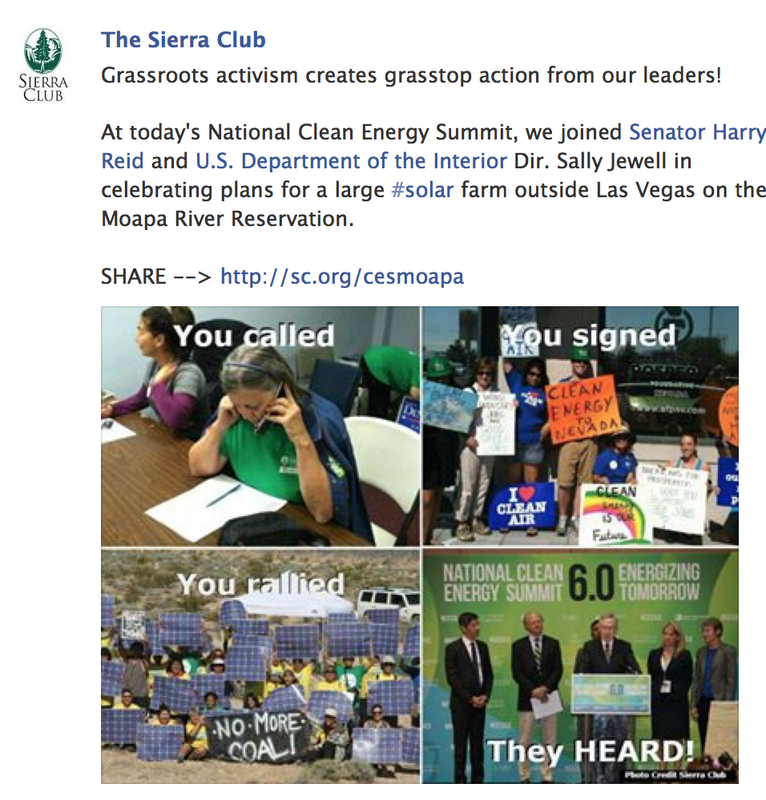 In its Facebook post, the Sierra Club credits its grassroots activists for the destruction of three square miles of desert for a solar facility. No mention of the need for Nevada legislators to support more distributed generation like the project planned at Mandalay Bay, which can meet our clean energy needs without destroying wildlands. Make no mistake, it will take a lot of lobbying and legislative progress to get Nevada onto a path where more consumers become clean energy generators. But that is not what happened most recently in Nevada's capitol. State legislators passed a bill (S.B. 123) that will fortunately lead to the closure of the Reid Gardner coal plant, but unfortunately allow NV Energy to replace it with what will likely be 550 megawatts of new natural gas generation. The early version of the bill explicitly called for rooftop solar quotas, but it appears NV Energy's lobbying effort stripped that out before it was passed. The Sierra Club supported the final bill, despite these significant compromises. As Nevada builds more natural gas power plants to replace Reid Gardner, it will also add up to 350 megawatts of clean energy. What form will this clean energy take? 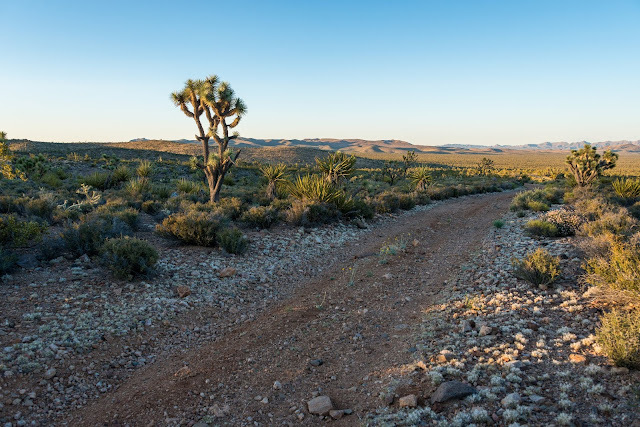 Will environmental groups in Nevada continue to celebrate dozens more square miles of habitat destruction, or will they demand smart and sustainable clean energy on rooftops and on already-disturbed lands. With large-scale solar and wind energy applications targeting the mostly-pristine Pahrump, Amargosa, and El Dorado Valleys outside of Las Vegas, ensuring a more sustainable clean energy path will require the kind of grassroots activism seen California. In California's Inland Empire, the Sierra Club's My Generation Campaign is creating local support for rooftop solar, and fighting back against utility companies that are lobbying against rooftop solar. Utility companies will be quite happy to continue destroying our wildlands for whatever energy source we demand, as long as they continue to profit. As environmentalists, we should be demanding the overhaul of a broken energy system that does not value sustainability; our clean energy solutions should prioritize the protection of our wildlands and communities, and not trade one for another. By purchasing a renewable energy system with cash or through a loan, a homeowner can completely pay off his or her system and then independently produce clean energy. "There’s absolutely no such thing as a $0 down solar lease or PPA and here’s why. A requirement of both of these financing programs is that you agree upfront to give the leasing or PPA company your 30% federal tax credit which is worth thousands of dollars as well as any other financial incentives. Japan, Germany, and our state of Hawaii, will pay residents between 13 - 37 cents per kilowatt hour, here in California they will pay a commercial FiT in a few counties at 17 cents per kilowatt hour, No Residential FiT and they wont let us oversize our Residential Renewable Energy systems. 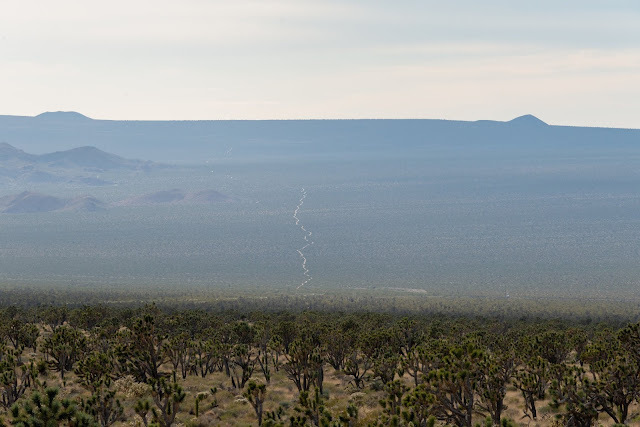 Yucca Mountain: Dead or Alive?